In the audience for the second showing were DC -based performance artists Binahkaye Joy and Margaux Delotte-Bennett of the theater company The Saartjie Project. Delotte-Bennet is producing her own Fringe show that runs this week and has already garnered amazing reviews. Singer Deja Belle, a phenomenal soul singer was also an audience member. Make sure you get your tickets for the remaining shows that include tonight’s show at 10pm and Saturday and Sunday for an evening and afternoon showing respectively. ← Running: AMOK Opens With Great Success! I have listened to some of the music you have featured in the show. It is absolutely awesome. My theater company Rise and Walk has a play coming to the DC Black Theatre festival as well. It’s called “Verbalized Ink”. Looking forward to seeing your show. Hopefully you will check out ours as well. Wishing you continued success. Thank you so much for visiting and leaving such kind words. Will definitely try to check out your show! 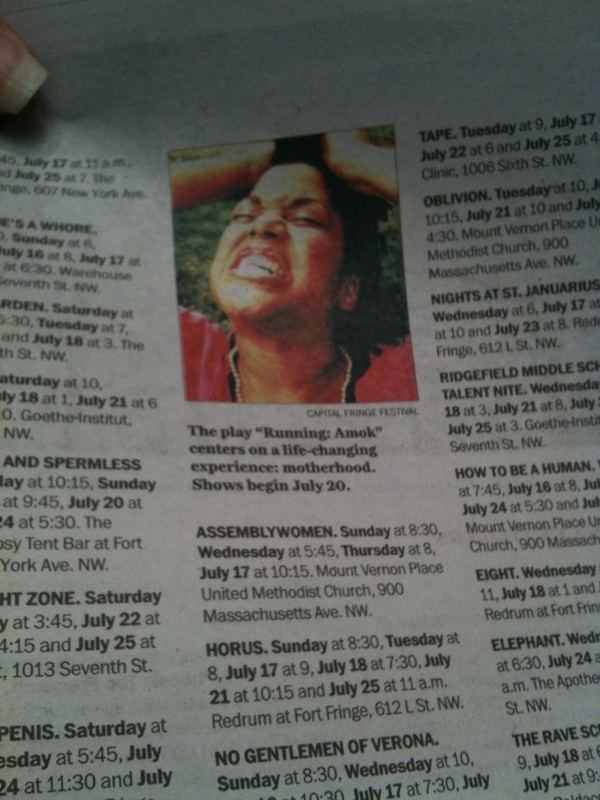 Running: AMOK won’t be in the DC Black Theatre Festival this year– but the festival is presenting our Spring run May 15-21. Hope to see you at a show!